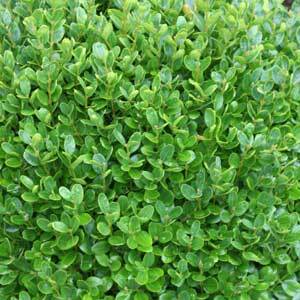 An excellent low growing Box Hedge for Australian gardens Buxus Suffruticosa is a slow growing box hedging plant well suited for low hedges along pathways. Buxus sempervirens Suffruticosa have a rounded leaf, the foliage is dark and dense growing. Probably best suited to low hedges or borders of 30 – 50 cm. This is a slow growing plant, a characteristic that makes it such a good plant for low growing hedges. The foliage colour is a little brighter than the common ‘English Box’ and with a tight neat habit it is well suited for use in topiary as well as low hedges and borders. Also suited to container growing where it can be shaped into balls or boxes as required. Best planted at around 15 – 20cm apart to form a continuous low hedge Buxus sempervirens Suffruticosa can easily be pruned to height. Use a slow release fertiliser applied in early spring, plants need to watered through summer when young.